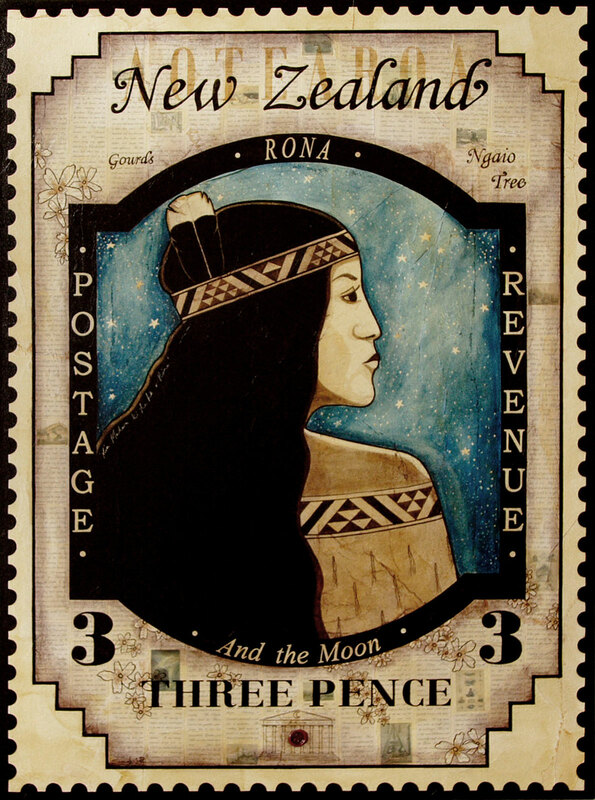 Rona: Inspired by the ‘1935 3d Wahine stamp’ and early 90s’ tourism posters and postcards. Ngaio flower: (Myoporum laetum) scattered around the boarder are blossoms from the tree that Rona clutched onto. Temple of Artemis: Greek goddess identified with the moon and fertility. ‘Kia mahara ki te he o Rona’ An old proverb ‘Remember the wrongful act of Rona’ meaning, be careful of what you say and do as it may come back on you. The general design of this stamp was based on a Tango poster I collected whilst in Argentina. Rona had forgotten water to cook the meal she was prepearing for her husband and sons upon their arrival from fishing. She ran towards the spring at night and fell. Rona cursed frustrated at the moon. The Moon heard and as a punishment, she seized Rona, who desperately she clutched a ngaio tree as she was pulled towards the moon. When the moon is full, Rona, her gourds and the Ngaio tree can be seen.